AS Deepavali is celebrated tomorrow, it may not be inappropriate to remember the many Indian Malaysians who have done the nation proud as athletes and sports administrators. Sports is supposed to be race, colour and creed-blind. But in this instance, I depart from these strictures to hail the contributions of Malaysian Indian sports figures, if only because there is now a dearth, perhaps even a virtual absence of them as seen in the national contingent to the Rio Olympics. The Malaysian contingent to the 1968 Mexico Olympics had 45 Indians out of 60 athletes and officials. What may be the reasons for the decline? 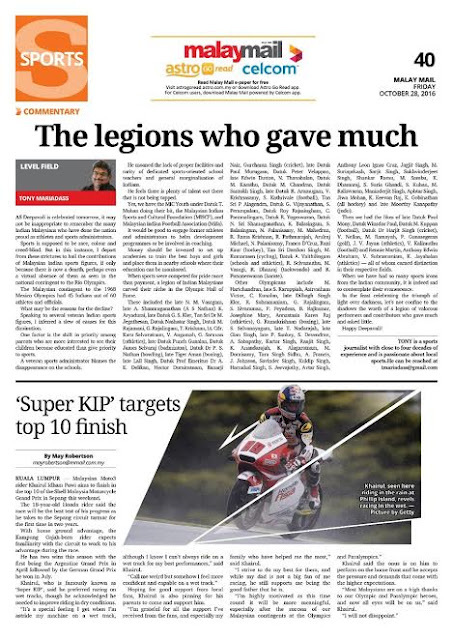 Speaking to several veteran Indian sports figures, I inferred a slew of causes for this diminution. One factor is the shift in priority among parents who are more interested to see their children become educated than give priority to sports. A veteran sports administrator blames the disappearance on the schools. He moaned the lack of proper facilities and rarity of dedicated sports-oriented school teachers and general marginalisation of Indians. He feels there is plenty of talent out there that is not being tapped. Yes, we have the MIC Youth under Datuk T. Mohan doing their bit, the Malaysian Indian Sports and Cultural Foundation (MISCF), and Malaysian Indian Football Association (Mifa). It would be good to engage former athletes and administrators to helm development programmes or be involved in coaching. Money should be invested to set up academies to train the best boys and girls and place them in nearby schools where their education can be monitored. When sports were competed for pride more than payment, a legion of Indian Malaysians carved their niche in the Olympic Hall of Fame. These included the late N. M. Vasagam, late A. Shanmuganathan (A S Nathan) K. Aryadurai, late Datuk G. S. Kler, Tan Sri Dr M. Jegathesan, Datuk Nashatar Singh, Datuk M. Rajamani, G. Rajalingam, T. Krishnan, Lt. Cdr. Karu Selvaratnam, V. Angamah, G. Saravan (athletics), late Datuk Punch Gunalan, Datuk James Selvaraj (badminton), Datuk Dr P. S. Nathan (bowling), late Tiger Aman (boxing), late Lall Singh, Datuk Prof Emeritus Dr A. E. Delikan, Hector Durairatnam, Banarji Nair, Gurcharan Singh (cricket), late Datuk Paul Murugasu, Datuk Peter Velappan, late Edwin Dutton, N. Thanabalan, Datuk M. Karathu, Datuk M. Chandran, Datuk Santokh Singh, late Datuk R. Arumugam, V. Krishnasamy, S. Kathrivale (football), Tan Sri P Alagendra, Datuk G. Vijayanathan, S. Perampalam, Datuk Roy Rajasingham, C. Paramalingam, Datuk R. Yogeswaran, Datuk N. Sri Shamuganathan, K. Balasingam, S. Balasingam, N. Palanisamy, M. Mahedran, R. Rama Krishnan, R. Pathmarajah, Arulraj Michael, N. Palanisamy, Franco D’Cruz, Rani Kaur (hockey), Tan Sri Darshan Singh, M. Kumarasen (cycling), Datuk A. Vaithilingam (schools and athletics), R. Selvamuthu, M. Vasugi, R. Dhanraj (taekwondo) and R. Punaneswaran (karate). Other Olympicans include M. Harichandran, late S. Karuppiah, Asirvatham Victor, C. Kunalan, late Dilbagh Singh Kler, R. Subramaniam, G. Rajalingam, S. Sivaraman, P. Peyadesa, B. Rajkumar, Josephine Mary, Annastasia Karen Raj (athletics), G. Ramakrishnan (boxing), late S. Selvanayagam, late T. Nadarajah, late Gian Singh, late P. Sankey, S. Devendran, A. Sabapathy, Kartar Singh, Ranjit Singh, K. Anandarajah, K. Alagaratnam, M. Doraisamy, Tara Singh Sidhu, A. Francis, J. Johnson, Savinder Singh, Kuldip Singh, Harnahal Singh, S. Jeevajothy, Avtar Singh, Anthony Leon Ignas Cruz, Jagjit Singh, M. Suriaprkash, Sarjit Singh, Sukhvinderjeet Singh, Shankar Ramu, M. Sambu, K. Dhamaraj, S. Suria Ghandi, S. Kuhan, M. Kaliswaran, Maninderjit Singh, Aphtar Singh, Jiwa Mohan, K. Keevan Raj, K. Gobinathan (all hockey) and late Moorthy Kanapathy (judo). Then we had the likes of late Datuk Paul Mony, Datuk Winsdor Paul, Datuk M. Kuppan (football), Datuk Dr Harjit Singh (cricket), V. Nellan, M. Ramayah, P. Gunasegeran (golf), J. V. Jayan (athletics), V. Kalimuthu (football) and Rennie Martin, Anthony Edwin Abraham, V. Subramaniam, K. Jayabalan (athletics) — all of whom earned distinction in their respective fields. When we have had so many sports icons from the Indian community, it is indeed sad to contemplate their evanescence. In the feast celebrating the triumph of light over darkness, let’s not confine to the shadows the worth of a legion of valorous performers and contributors who gave much and asked little. SOUTHEAST Asian nations and Malaysia especially, are forewarned that Philippine sports standards could well rise on the back of President Rodrigo Duterte’s unequivocal support for flying the flag in regional, continental and global sporting arenas. 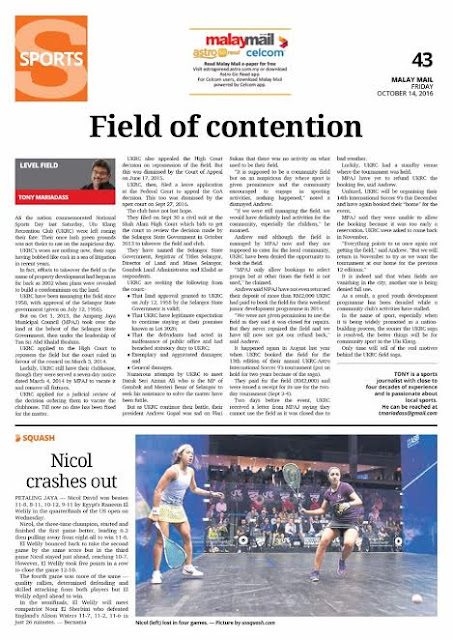 Last week Duterte proclaimed October as volleyball month and placed the hosting of the 2016 FIVB Women’s Club World Championship, which started this week at the Mall of Asia Arena, Pasay, in the spotlight. The proclamation is indicative of the Duterte administration’s strong support for Philippine sports. 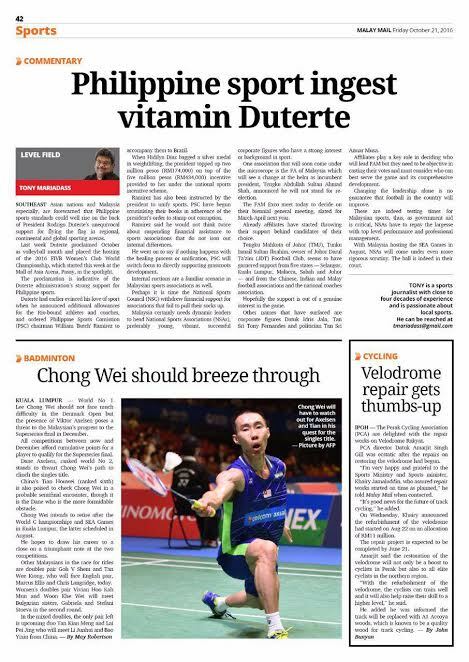 Duterte had earlier evinced his love of sport when he announced additional allowances for the Rio-bound athletes and coaches, and ordered Philippine Sports Comission (PSC) chairman William ‘Butch’ Ramirez to accompany them to Brazil. When Hidilyn Diaz bagged a silver medal in weightlifting, the president topped up two million pesos (RM174,000) on top of the five million pesos (RM434,000) incentive provided to her under the national sports incentive scheme. Ramirez has also been instructed by the president to unify sports. PSC have begun scrutinising their books in adherence of the president’s order to stamp out corruption. Ramirez said he would not think twice about suspending financial assistance to sports associations that do not iron out internal differences. He went on to say if nothing happens with the healing process or unification, PSC will switch focus to directly supporting grassroots development. Internal ructions are a familiar scenario in Malaysian sports associations as well. Perhaps it is time the National Sports Council (NSC) withdrew financial support for associations that fail to pull their socks up. Malaysia certainly needs dynamic leaders to head National Sports Associations (NSAs), preferably young, vibrant, successful corporate figures who have a strong interest or background in sport. One association that will soon come under the microscope is the FA of Malaysia which will see a change at the helm as incumbent president, Tengku Abdullah Sultan Ahmad Shah, announced he will not stand for re-election. The FAM Exco meet today to decide on their biennial general meeting, slated for March-April next year. Already affiliates have started throwing their support behind candidates of their choice. Tengku Mahkota of Johor (TMJ), Tunku Ismail Sultan Ibrahim, owner of Johor Darul Ta’zim (JDT) Football Club, seems to have garnered support from five states — Selangor, Kuala Lumpur, Malacca, Sabah and Johor — and from the Chinese, Indian and Malay football associations and the national coaches association. Hopefully the support is out of a genuine interest in the game. Other names that have surfaced are corporate figures Datuk Idris Jala, Tan Sri Tony Fernandes and politician Tan Sri Anuar Musa. Affiliates play a key role in deciding who will lead FAM but they need to be objective in casting their votes and must consider who can best serve the game and its comprehensive development. Changing the leadership alone is no guarantee that football in the country will improve. These are indeed testing times for Malaysian sports, thus, as government aid is critical, NSAs have to repay the largesse with top level performance and professional management. With Malaysia hosting the SEA Games in August, NSAs will come under even more rigorous scrutiny. The ball is indeed in their court. AS the nation commemorated National Sports Day last Saturday, Ulu Klang Recreation Club (UKRC) were left rueing their fate: Their once lush green grounds was not theirs to use on the auspicious day. UKRC’s woes are nothing new, their saga having bobbed like cork in a sea of litigation in recent years. In fact, efforts to takeover the field in the name of property development had begun as far back as 2002 when plans were revealed to build a condominium on the land. UKRC have been managing the field since 1958, with approval of the Selangor State government (given on July 12, 1958). But on Oct 1, 2013, the Ampang Jaya Municipal Council (MPAJ) took over the land at the behest of the Selangor State Government, then under the leadership of Tan Sri Abd Khalid Ibrahim. UKRC applied to the High Court to repossess the field but the court ruled in favour of the council on March 3, 2014. Luckily, UKRC still have their clubhouse, though they were served a seven-day notice dated March 4, 2014 by MPAJ to vacate it and remove all fixtures. UKRC applied for a judicial review of the decision ordering them to vacate the clubhouse. Till now no date has been fixed for the matter. UKRC also appealed the High Court decision on repossession of the field. But this was dismissed by the Court of Appeal on June 17, 2015. UKRC, then, filed a leave application at the Federal Court to appeal the CoA decision. This too was dismissed by the apex court on Sept 27, 2016. The club have not lost hope. They filed on Sept 30 a civil suit at the Shah Alam High Court which bids to get the court to review the decision made by the Selangor State Government in October 2013 to takeover the field and club. 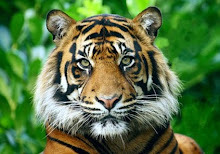 They have named the Selangor State Government, Registrar of Titles Selangor, Director of Land and Mines Selangor, Gombak Land Administrator and Khalid as respondents. Numerous attempts by UKRC to meet Datuk Seri Azmin Ali who is the MP of Gombak and Menteri Besar of Selangor to seek his assistance to solve the matter have been futile. But as UKRC continue their battle, their president Andrew Gopal was sad on Hari Sukan that there was no activity on what used to be their field. “If we were still managing the field, we would have definitely had activities for the community, especially the children,” he moaned. Andrew said although the field is managed by MPAJ now and they are supposed to cater for the local community, UKRC have been denied the opportunity to book the field. “MPAJ only allow bookings to select groups but at other times the field is not used,” he claimed. Andrew said MPAJ have not even returned their deposit of more than RM2,000 UKRC had paid to book the field for their weekend junior development programme in 2014. It happened again in August last year when UKRC booked the field for the 13th edition of their annual UKRC-Astro International Soccer 9’s tournament (put on hold for two years because of the saga). They paid for the field (RM2,000) and were issued a receipt for its use for the two-day tournament (Sept 3-4). Two days before the event, UKRC received a letter from MPAJ saying they cannot use the field as it was closed due to bad weather. Luckily, UKRC had a standby venue where the tournament was held. MPAJ have yet to refund UKRC the booking fee, said Andrew. Unfazed, UKRC will be organising their 14th International Soccer 9’s this December and have again booked their “home” for the event. MPAJ said they were unable to allow the booking because it was too early a reservation. UKRC were asked to come back in November. It is indeed sad that when fields are vanishing in the city, another one is being denied full use. As a result, a good youth development programme has been derailed while a community club’s activities have stalled. In the name of sport, especially when it is being widely promoted as a nation-building process, the sooner the UKRC saga is resolved, the better things will be for community sport in the Ulu Klang. Only time will tell of the real motives behind the UKRC field saga. THE 93th Malaysian Athletics Open at Universiti Malaya Stadium last weekend was a disappointment! The venue was great, perched on a small hill with other heights in the backdrop, excellent tracks and a spectator stand to accommodate a small crowd, but that it did not have an electronic scoreboard detracted from the glamour of the meet. Sadly, the championship hosted by Selangor AA and assisted by Malaysian Athletics Federation (MAF), received poor support from state associations, several of whom only sent token participation — less than 10 athletes in some cases. Naturally, the quality suffered. Even the presence of athletes from six foreign countries — Kuwait (14 athletes), India (four), Philippines (11), Singapore (13), Thailand (10) and Brunei (five) — couldn’t entice states to send their best. A total of 323 athletes (minus foreign participation) from 14 states, Police, Armed Forces and National Sports Council’s back-up squad competed in the three-day meet which staged 41 events. The Malaysia Games in Kuching in July had better participation. There are athletes from schools, colleges and universities — all of whom have their own championships and were well represented in their meets. What has happened to them? Do state AAs have data bases of their athletes and have programmes for them? For the Malaysia Games, the athletes are handled by state sports councils who fund training, allowances, expenses and rewards for achievements. State AAs have financial constraints and are unable to conduct proper programmes. But is it not the duty of state AAs to look for funds for their activities? After all, MAF allocate RM5,000 to each state AA (depending on their activities and participation in the national championships and state meets). Some state meets are a farce. Can we blame the current state and standard of athletics in the country on the lackadaisical attitude of state AAs? Those that sent a decent squad to the Malaysian Open included Johor (46), Armed Forces (38), Sarawak (26), Sabah (22) and Perak (20). Eight states sent less than 20 athletes including hosts Selangor (17), while two East Coast states sent fewer than 10 athletes! It was no surprise Armed Forces, which had gone on a recruitment drive, topped the meet with 16 gold, seven and six bronze medals. The next best were Sabah (2-4-3), Kuala Lumpur (2-4-1), Selangor (2-3-4), Sarawak (2-2-5) and Malacca (2-1-0). Only two meet records were broken last weekend. Both by Kuwait in shot put (Mohammad Meshari’s 19.45m, erasing India’s Jaiveer Singh’s 18.44m) and in the 110m hurdles (Atyouha Yaqoub’s 13.83s, erasing Mohd Robani Hassan’s 13.85s). In the past, events like the Government Services and Inter-Bank meets were as glamorous, if not better than the national championship. Several states claimed their athletes had peaked at the Malaysia Games. This raises the question of planning and scheduling of events. Olympian Nauraj Singh Randhawa skipped the event because he had not trained for five weeks since returning from the Rio Olympics where he had cleared 2.26m and just missed qualifying for the final. The national record holder at 2.29m, Nauraj should have given the national championship more respect. He owed it to his fans after his Olympic debut. That he did not train for five weeks and was in no condition to compete was a weak excuse. The badminton players returned from Rio and despite hectic celebratory functions, trained and competed in the Korea and Japan Opens. For the record Lee Hup Wei won the high jump with a clearance of 2.16m. The national championship focused on sprinter Khairul Hafiz Jantan’s attempt to break the 48-year 200m record (20.92s) set by Tan Sri Dr M. Jegathesan. Even Sports Minister Khairy Jamaluddin and his deputy Datuk M. Saravanan took leave from the F1 race in Sepang to be present to witness the ‘record breaking feat’. But the Malaccan could only muster 21.10s to win from Armed Forces G. Aravinn Thevarrr, who clocked 21.14, with Sarawak’s Jonathan Nyepa (winner of 100m in 10.53s) finishing third in 21.18s. Jega’s record was set was good for an Olympic semifinal at the 1968 Mexico City Games. Today, it won’t win you a gold medal in Asian meets. The last Asian Games in Incheon had 20.14s as the winning time while the bronze medal was 20.18s. At the Singapore SEA Games last year the gold medal was won in a time of 20.89 while the bronze medal time was 21.13s. As long as we continue to set low standards, neglect talent identification and long term development work, we will remain athletic minnows. The next Malaysian Open is expected to be in March to serve as final selection for the Kuala Lumpur SEA Games. It is hoped state AAs starting work from today to make a difference. If you were a resident of the Jalan Duta-Segambut areas in Kuala Lumpur from mid-1970s through to the early 1990s, and if you happened to be up and about rather early, chances are you would have encountered a lone determined figure, wreaked in perspiration,walking briskly by the side of the road heading towards Jalan Duta. 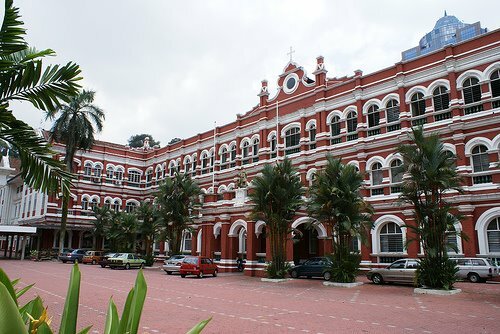 The early morning ritual of national walker V. Subramaniam would have begun at around 4.30am from his home in Batu Caves to Jalan Duta where the Examination Syndicate was located in the days when the area was a secluded forested stretch where even a waterfall existed punctuated a few government buildings. The monotonous regularity of ritual – absent only when it rained torrents which was seldom – the obvious determination of its performer, and the harvest of medals it brought him, established Subramaniam as the national athlete with a peerless work ethic. Which is why these days you would be surprised to see the man taking your order for Western food and serving you at a food court in Taman Mewah in Ampang. Sadly, the 67-year-old for international walker, has fallen into bad times after he lost his job as national walks coach of eleven years with the National Sports Council last August. The Malaysian Athletics Federation (MAF) took a bold move to remove old and experienced coaches in their revamp of the coaching set up in preparation for the 2017 Kuala Lumpur Sea Games. 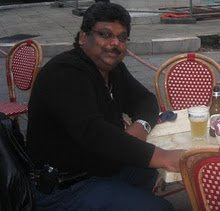 Subramaniam tried to get a job as a coach with States AAs like Federal Territory and Terengganu, but in vain. Although KLFTAA promised to use him for walking clinics, it is still in the planning stages. “I had to make ends meet because there was little I could do with my RM320 pension I get from my eleven years’ service with Telekoms although I worked there for 30 years as they were privatised after that,” said Subra, as he was more popularly known, when met at his stall at the food court. “Although my children are all grown up and do support me a little, but I have eight grandchildren and want to be independent to be able to buy a few things for them and also for my daily expenditure,” added Subra whose wife Krishnaveny (64) who had passed away last November. Sadly, life has been a struggle for Subra all his life. He went to win a total six gold medals and five silvers in five Sea Games, qualified for the 1980 Moscow Olympics Games, but had to skip it because of the boycott by Malaysia, in the 1978 Bangkok Asian Games won the silver medal and 1982 Games finishing fourth and won two bronze medals from the Asian Track and Field in 1979 and 1981. He was named Selangor Sportsman for two consecutive years – 1978 and 1979 – and was also named the National Sportsman of the Year in 1978. Happier times when Subra (second from left) was named Sportsman of The Year in 1978 with Sportswoman of The Year Slyvia Ng and then - Malaysian Amateur Athletics Union president the late Tan Sri Ghazali Shafie (left), and then Badminton Association of Malaysia president, the late Tan Sri Khir Johari. 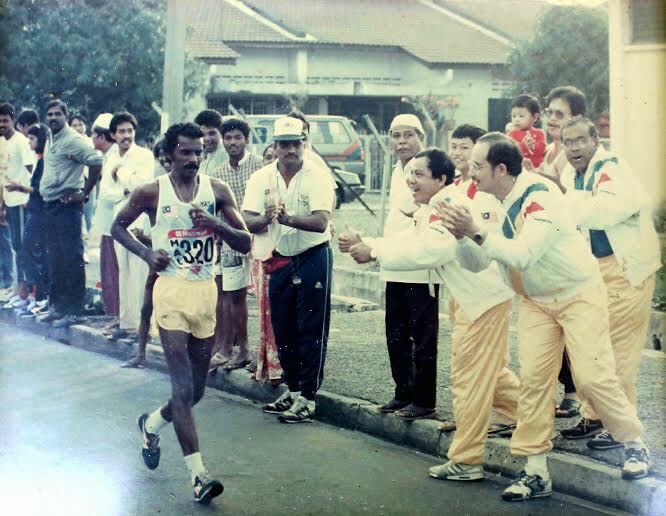 Datuk Seri Najib (right), who was then Culture, Youth and Sports Minister, and other supporters cheer Subramaniam during the 20km walk at the 1989 KL SEA Games. Subramaniam went to win the race. But every step of his walk he had to make sacrifices and anyone else in his shoes would have long ago given up. 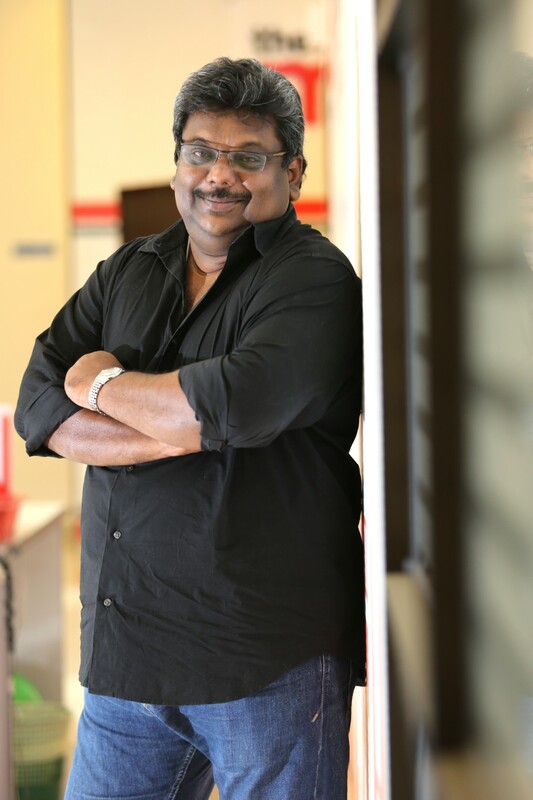 But not the father of three boys - late Saravanan, Rajinikanth (41) and Sundhar (38) and two girls Uma Sunthary (41) and Shanti (39). Subra said that it was former walker B.Thirukumar, who told him about the stall available in the Ampang area and knew a lady who cooked western food who was looking for an opportunity to do business. “I managed to find this stall and got the lady (Siti Zubaidi) who had worked with a Chinese stall owner for nearly ten years assisting in preparing western food to team up with me,” said Subra who has been operating the stall since last October. He initially was operating the stall from morning to night and paid a rent of RM800 a month and business was good for starters. Subra had to come up with a start-up capital of RM7,000 and spends anything between RM50 to RM200 a day to buy meat and grocery for his business. “These days I make about RM1,200 a month after deducting expenses and share it 50-50 with Siti. “It is not much, but I rather being doing something instead of just sitting at home,” said Subra who still continues to walk daily for at least an hour. Subra who was a familiar figure at the Lake Gardens training walkers, has not been training anyone since January. Indeed a sad state of affairs for such a decorated athlete who has brought so many honours to the country including winning the Sportsman Award of the Year besides having trained so many national walkers to glory. Apparently, the fighter in Subra will not yield in the face of life’s vicissitudes.